We can accommodate an extended swing arm or A arm at no additional charge for catalog listings of standard 'plus' lengths or customize to your specification for a low added fee. Galfer brake lines consist of three layers. The inner layer is a PTFE type 62 Teflon. The second layer consists of 16 strands of braided stainless steel. The outer layer is a plastic coating that protects the bike from scratches and keeps unwanted moisture out of the line. You can choose from Clear, Black, White, Dark-Smoke, Red, Orange, Yellow, Gold, Green, Blue, NO EXTRA CHARGE. The kits come standard with polished silver on brass fittings with matching bolts. Upgrading to a gold finish or aluminum ends is available for an extra fee. We currently offer Galfer brake lines for almost any motorcycle or ATV out there, if Galfer does not list an application part number, we can have it custom made to your specifications or have Galfer copy your original stock lines. 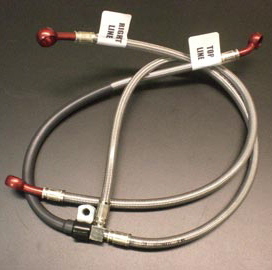 For Sport bikes, the most common line set up is a dual line kit (pictured here) for the front. It eliminates the stock splitter by bolting both lines directly to the master cylinder with a double banjo bolt and directly routing down to each caliper. This style kit provides a stiffer feel at the lever and allows for cleaner routing. Traditional OEM or 3 line kits are available for some models, as are rear and hydraulic clutch lines. Please check our online PDF catalog for availability. For our ATV riders, we also have 2 and 3 line front kits available: the 3 line being the most popular, as well as rear lines for most of our applications. We can accommodate an extended swing arm or A arm at no additional charge for catalog listings of standard 'plus' lengths or customize to your specification for a low added fee. Off Road Brake Line Kit with stiffening section. Galfer offers off-road lines for many dirt bike applications. These come in the MX style with a stiffening section (pictured here). The CR style lines are also available upon request. Now available for Harley Davidsion brakes and Metric Cruisers. These include the proper American Threaded bolts for HD and available with 10mm or 12mm fittings or 10mm hardware for your metric cruiser. Pictured here are examples of Clear Coated Stainless Steel Brake Hoses with Chrome Fittings, Brackets & Bolts (prices vary). These directly compete with Goodrich Brake Lines for the Cruiser Market. They also match Barnett Cables and come in a range of colors. A newer feature from both Barnett & Galfer is the upgrade to Platinum Series (link to hose/line/fittings page with tag on Platinum) which makes the braiding Brighter to match Chromed parts - still includes Clear plastic coat. We are glad to combine orders to save you time & shipping costs on your customizations. Please e-mail or call for a quote. Galfer's GP Series Brake line Kits address a few things with today’s sportbikes. SPACE. While a traditional 2 line kit off the master cylinder is still the choice of the masses, the Galfer GP Series Brake Line Kits offer compact mounting by having 1 line coming off the master cylinder and then splitting into two lines at the lower triple clamp. This unique set up routes the lower lines outside of the forks just like GP bikes. Our standard GP Series Brake line kit comes in Clear hose, with Blue aluminum banjo fittings and red aluminum bolts. 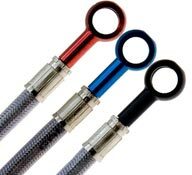 You can custom order these brake lines in any of our color combinations for an additional custom fee. Kits come complete with labeled hoses, lower triple clamp brake line brackets, new bolts and crush washers and bike specific instructions! Please if you can, update your database and keep the Newsletters Coming. I'm loving the performance of the dual front line I got from you. They work fantastic in the track...Thanks for answering my questions and changing my email address for me.